Hampton Court Palace comes alive during the festive season, and there are few places in the South East that offer such a spectacular and historic setting for an evening out with friends & family. 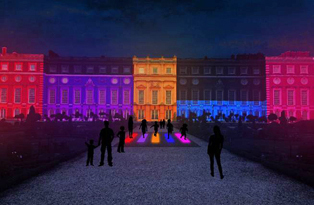 This year, the Palace has installed an interactive Light Trail in its ancient gardens, and is opening it doors to people of all ages to enjoy the magical environment they have created. Upon your arrival, you’ll be given a (rather beautiful) glow in the dark map to guide you around the pathways and flowerbeds of this magical outdoor space. Follow in the footsteps of kings as you wonder through the Palace’s world-famous Maze, which was designed by Henry VIII himself, all lit up for Christmas in stunning neon blue LEDs, and featuring delicate decorations in the tall hedgerows. Once you get to the center of the Maze, you’ll be treated to a beautiful light show which you can sit down and watch for as long as you like. The interactive lights in the gardens allow you to illuminate different trees, flowers, statues and shrubs by pressing the hidden buttons indicated on your map. The bright colours and clever angles of the lights create a really enchanting atmosphere, and it’s a joy to be so involved in bringing these ancient plants to life. The East Front of the Palace currently has movement sensors installed at its base, so that when visitors pass by this epic piece of medieval architecture, it reacts to their footsteps and puts on a moving light show that follows them down the pathway. All kinds of themed and seasonal food & drink stalls will be set up along this hour-long walkway, so you can warm your hands on a hot mug of mulled wine, sample some long-lost recipes from the 1500s, or gnaw at a cinnamon swirl on your journey around this extraordinary event. Remember to dress warmly, as this event is entirely outdoors. You won’t need willies because the paths are all either gravel, tarmac or paved, but gloves are an absolute must – your hands will be constantly in and out of your pockets to play with the interactive lights! Parking for 200 cars is available on site, but we recommend travelling on public transport. Hampton Court Station is just a stone’s throw from the Palace, and remember that the River Bus doesn’t run from London in the winter. The nearest tube station is at Wimbledon, where you can hop on the over ground and arrive at the Palace within about 15mins. Or, you can get the tube to Richmond and catch the R68 bus for a 15min ride through some truly fascinating historical towns. Tickets are just £10 per adult, £5 per child and £5 for HRP Members. However, if you arrive at the Palace early for a whole day of sightseeing, you can get into the Light Trail for free after 4.30pm. Book your tickets now on HRP’s official website – there are still loads of spaces going! 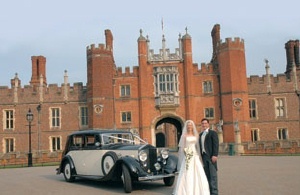 We at Function Fixers can also book Hampton Court Palace as a venue for corporate events, private occasions and weddings. Just contact us here for more details – and remember, our service is 100% free of charge!